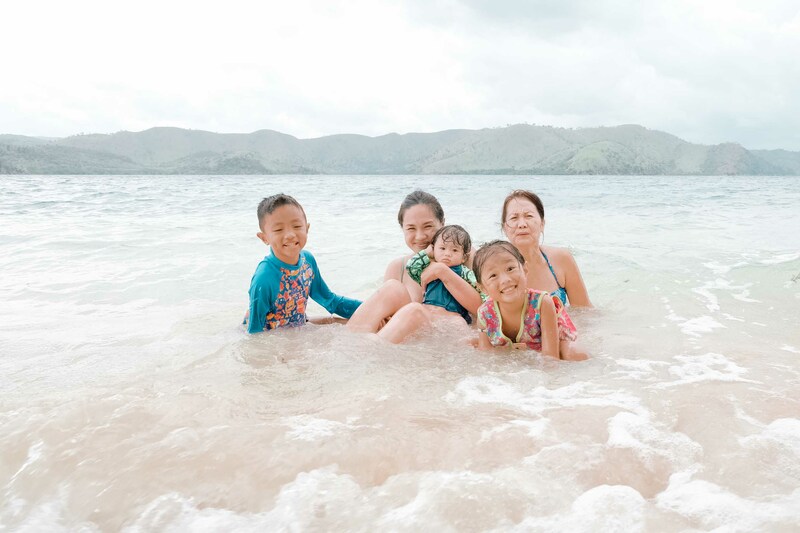 Our 4 day trip to Coron, Palawan with our 3 kids and my mom was one of the most memorable ones we've taken as a family. 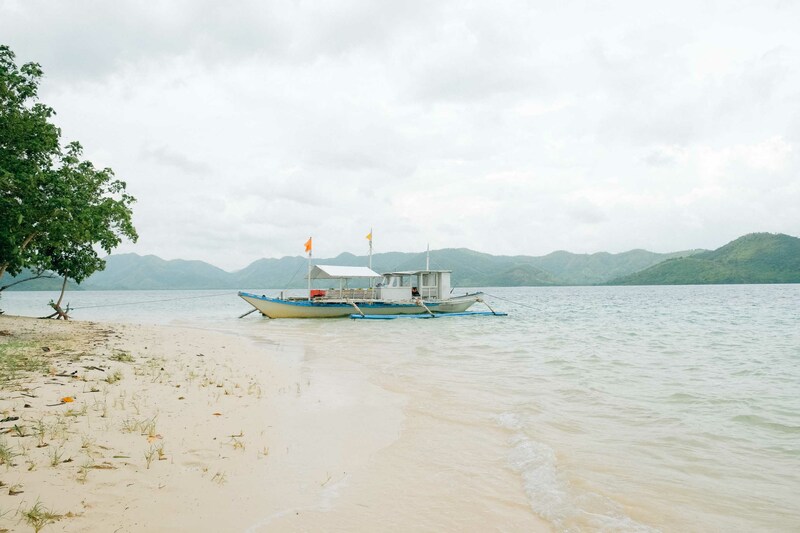 Aside from being gorgeous (Palawan wasn’t voted Best Island in the World by Conde Nast Traveller for nothing), we had so much fun doing different activities together and relaxing by the beach. Cruz, my eldest, who was 7 at the time, impressed us with his snorkelling ability and an unexpected adventurous spirit – he was cannonballing into lagoons from the rocks. Sinta, 5, although not as daring as her brother, enjoyed her time in a life vest while riding on my back in the water. 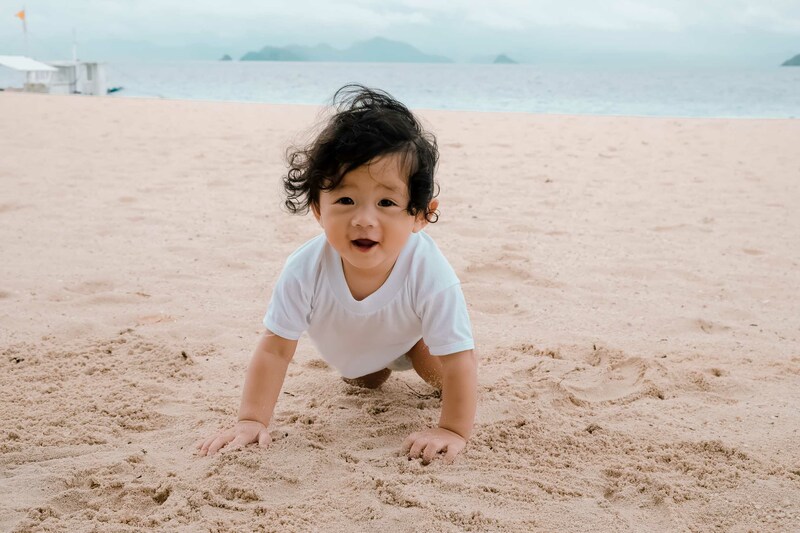 Pietro, unlike other babies, immediately took to the sand and started crawling around the beach at full speed (sometimes into the water) without even the initial gross-what-is-this-sand phase. We chose Club Paradise mainly because it was on its own island with an incredible beachfront, away from the bustle of the main island of Coron. 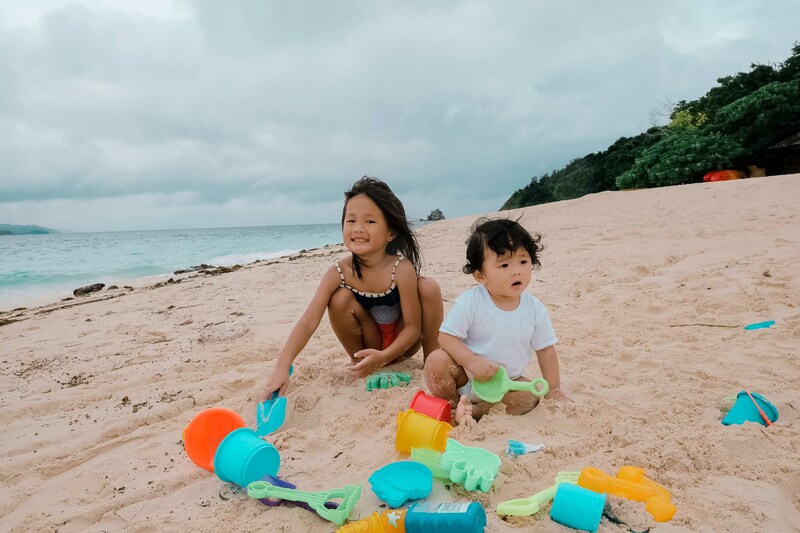 We also knew we would be getting stellar service (being fans of Discovery Shores Boracay, which is owned by the same company), especially since we would need all the help we could get travelling with 3 kids. Just a word of warning, Club Paradise is another hour away from Coron by pump boat and then speedboat. Since our flight was delayed, the last leg of our trip via speedboat was made in complete darkness, pouring rain and huge waves. When we finally arrived at the island where the resort was, I think we were all surprised we made it in one piece. The service didn’t disappoint. The staff made it a point to greet us with a smile and offered to help carry our things, shaded us from the rain with umbrellas and even took special orders and prepared Pietro’s food of steamed veggies, plain soup and rice with whatever was available in the kitchen. They have their own pool, bar, restaurant, and dive shop. Did I mention the beachfront was terrific? We had it all to ourselves every morning. Snorkelling around the island just metres off the beach was also the best of the trip. It’s probably because boatloads of tourists don’t frequent that spot – the corals and sea life remain untouched and impressive. Our rating: 4 out of 5. The only downside was the remoteness of the resort. We had to travel long distances to do off-island activities, which can sometimes be a daunting task, especially with a baby in tow. There were also tons of mosquitos because of a small lagoon right outside our room. It didn’t help that it was raining every day, so pools of water gathered all around the resort. Don’t forget to bring sand toys and spend lots of time at the beach building sandcastles and take turns with another adult while you lounge on the chairs or take a quick nap in one of their hammocks. Make sure to keep an eye on your kids especially when in the water because the waves can get big. Bring mosquito repellent patches or lotion (we like this and this). Request for some baby-friendly food if you need to. The staff and kitchen are very accommodating. We spent a whole day enjoying the famous sights of Coron. We recommend taking the tour organised by JY Travel and Tours with Jhun Sabroso as the tour guide. I’m pretty sure he is on the best tour guides on the island and came highly recommended by a friend. He took his time at each spot, knew everything there is to know about Coron, and made sure we had the best time, making hilarious jokes along the way. He would also take our GoPros and free dive to the sea floor to provide excellent shots. We could tell that he loved his job and it was evident in how much fun we all had despite the constant downpour that day. We hit all the famous spots – the Twin Lagoons, Kayangan Lake, Siete Pecados Marine Park and the WWII Japanese shipwreck. Our favourites were the view of Kayangan Lake from the lookout point and swimming at the Twin Lagoons with Cruz jumping off the rocks. Swimming at the lagoons was a blast, but it requires getting through some rock formations either by swimming under them or climbing a wooden ladder to get through (at the hidden lagoon at Twin Lagoons). If your child is not confident with swimming or can’t climb precarious steps, it’s most likely that he/she will have to stay behind and wait in the boat. Both my 5-year-old and 6-month-old baby stayed in the boat with my mom while my husband, Cruz and I ventured out. Another option if you bring small kids along is to take turns with your partner or another adult staying with the child on the boat. Our rating: 4.5 out of 5. 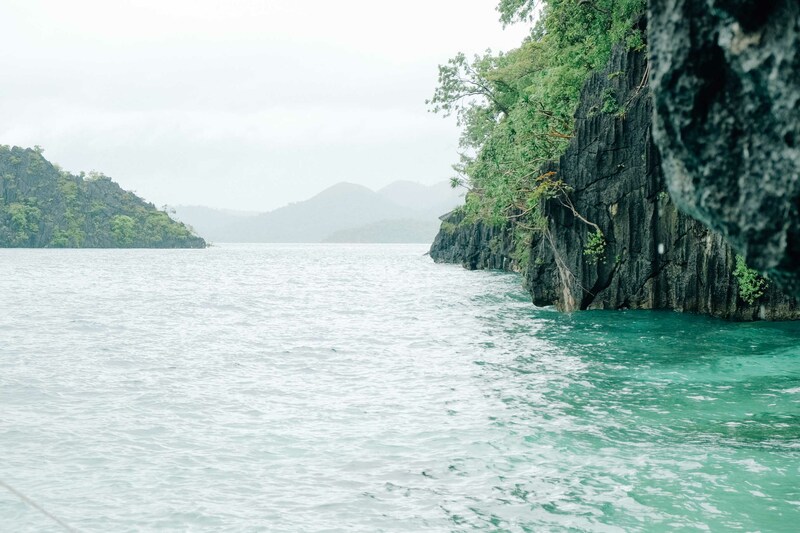 Coron’s beauty is breathtaking. If you want to take advantage of all the activities, it would be best to bring kids 7 years and older, with proper swimming skills. If you’re bringing an infant or a child who isn’t walking yet, a baby carrier is a must. Our little one napped in it while on the boat, and we were able to bring him along the long climb up to the Kayangan Lake lookout point. Bring a GoPro to capture all the swimming and snorkelling fun your kids are going to have. 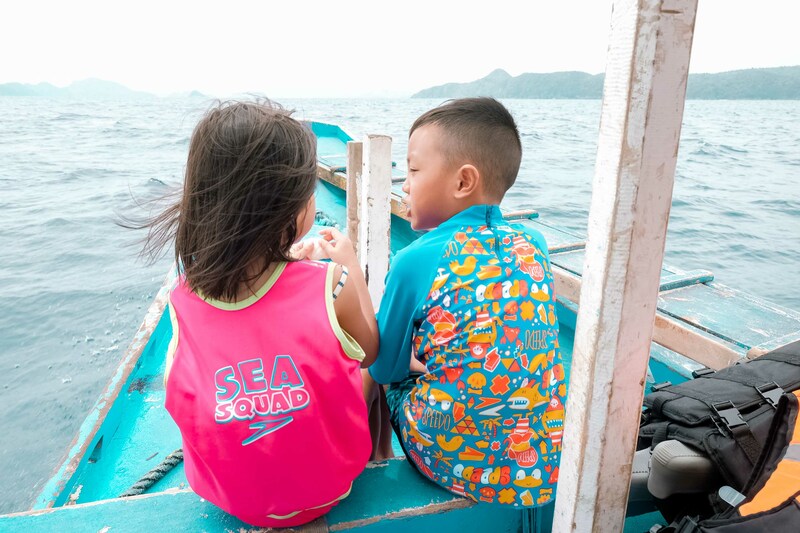 If you have young kids (4-6 years old), be prepared to do a lot of carrying – in the water, to get off the boat, up steps to get to a lookout point, etc. Unless they’re naturally fearless, very active and adventurous, they will need a lot of help. Bring rash guards and aqua shoes. We loved the Coron Tour, but because we were taking the tour with a bunch of other tourists, we had to be conscious about the time we spent at each spot and sometimes had to wait for others to get back to the boat before we could move on. But because we had a boat all to ourselves when we went on the Island hopping tour by Club Paradise, it was a much more relaxing day, and we took our time at each spot. 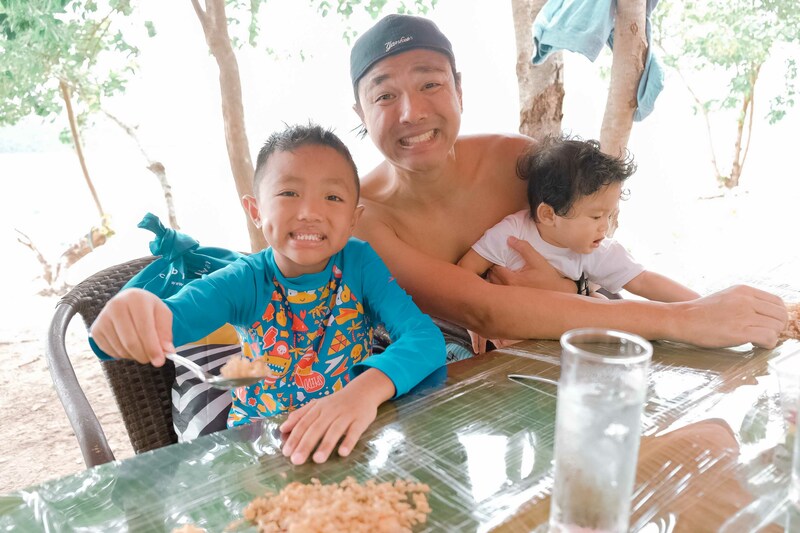 The first stop was snorkelling at Dimalanta Island where Cruz thoroughly enjoyed going off on his own and reporting back with descriptions of the fish and amazing corals that he saw. The next stop was lunch on a beach on Diatoy Island where the Club Paradise team set up a table, banana leaves and fantastic food. We ate with our hands and lounged after on blankets while the kids played in the water. The last stop of the tour was a sandbar at Malpagalen Island a couple of hundred metres from the Club Paradise island. We investigated a small cave with the kids and did some more lounging before heading back to the resort. Our rating: 4.5 out of 5. We loved getting on the resort’s private pump boat stocked with snorkelling gear, fresh towels and bottled water. We took it easy while the Club Paradise staff took care of everything and all we had to do was relax and enjoy Coron’s non-touristy islands which we had to ourselves. Again, bring rash guards and aqua shoes. 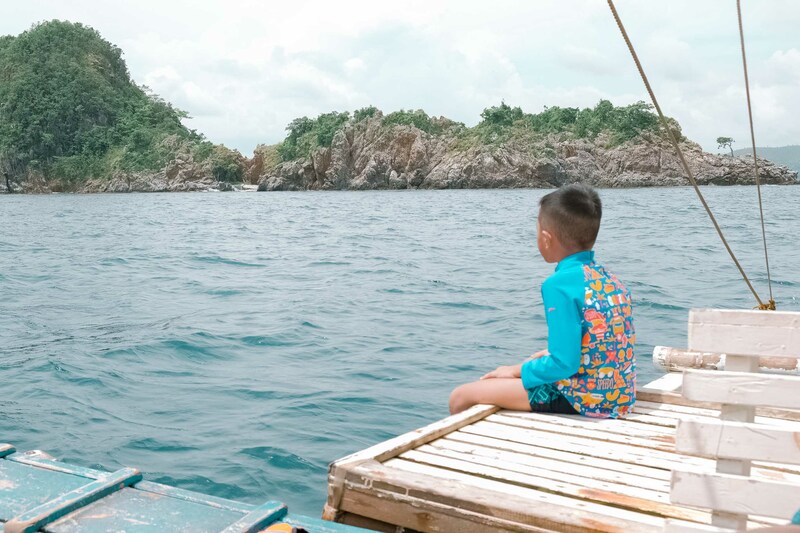 Have you taken a trip to Coron with your kids?